This quote couldn’t be more agraeeable as perfectly shape eyebrows are one thing everyone wants, so to fulfil this wish eyebrow embroidery has been introduced. Now not only women can have the eyebrow embroidery session but it has even been made accessible for men. With the passage of time, men have also become interested in grooming themselves and love to make themselves more representable. What better way to do that than starting with the eyebrows? 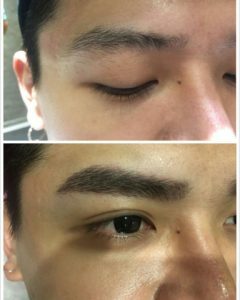 Browart Studio has help many men to improve their image, they had simply engaged Jenny for a complete eyebrow embroidery consultation and regained their confidence and convert into a loyalty customer of Browart Studio. There are in total four steps for the eyebrow embroidery session. The first step is identification and inspection, in this step you will be inquired as to what type of shape you want for your eyebrows and some ides will also be suggested to you by the stylist, according to your face shape and structure. The embroidery will be done according to your preferences. The next step is designing and forming the outlines for the eyebrows, so the procedure can be followed according to the lines drawn. Those lines can be drawn using an ordinary eyebrow pencil or if the stylist wants, he/she can also use some other tool instead of the eyebrow pencil . The lines would both be different on each eyebrow, so, there would be two different designs on the eyebrows so that you can choose from one of them. The one which would be chosen will be the design you have decided for your eyebrow embroidery. Following the designing procedure will be the numbing process which usually lasts 15 minutes or more. For this, a certain gel or numbing cream will be applied to make sure that the customers won’t feel any pain during the eyebrow embroidery session. This gel or cream will directly be applied onto the eyebrows. The fourth and last step uses an eyebrow embroidery instrument to create hair-like marks on the skin and then a color pigment will be applied to give those marks color to make your eyebrows look fuller. The pigment will be left to be absorbed by the skin. Now, you will have thicker and natural looking eyebrows. This work is done by a professional with much delicacy, so there will be no problems and the customers will get their desired eyebrows. Many of those who have tried it have been satisfied by the results and are content with their new look. You will most definitely not be disappointed by the results. It is definitely something worth trying. Contact us to book an appointment now!